﻿ Rising Sun Guest House, Seychelles Islands | FROM $77 - SAVE ON AGODA! Have a question for Rising Sun Guest House? "My room was comfortable, beautiful, very clean." "Good WIFI, a fine terrase with every room." 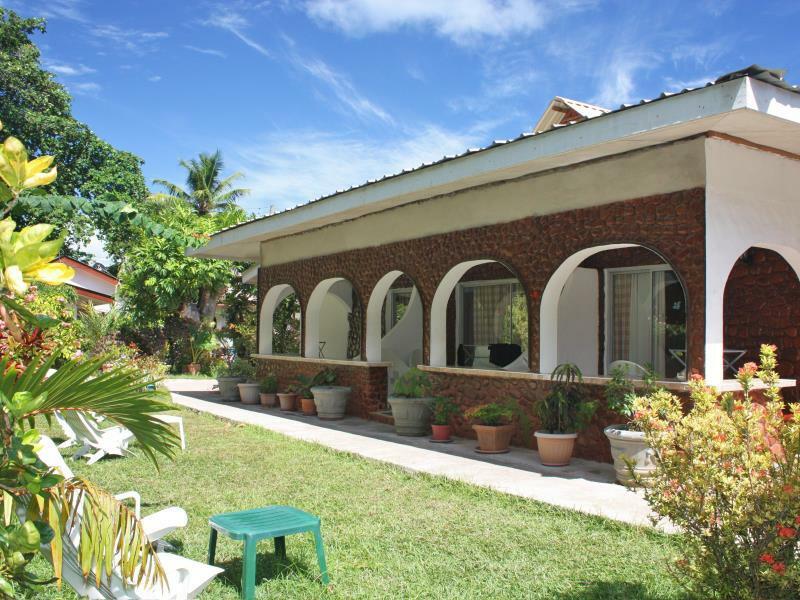 "Clean and homelike place for stay"
"The location is perferct near the shops and everything you n..."
Rising Sun Guest House, located in La Digue Island, Seychelles Islands, is a popular choice for travelers. The excitement of the city center is only 0.2 km away. With its convenient location, the hotel offers easy access to the city's must-see destinations. Rising Sun Guest House also offers many facilities to enrich your stay in Seychelles Islands. This hotel offers numerous on-site facilities to satisfy even the most discerning guest. In addition, all guestrooms feature a variety of comforts. Many rooms even provide non smoking rooms, air conditioning, balcony/terrace, fan, refrigerator to please the most discerning guest. The complete list of recreational facilities is available at the hotel, including diving, fishing, billiards, garden. Enjoy unparalleled services and a truly prestigious address at the Rising Sun Guest House. "Very nice guesthouse run by a family." Location is fine. In between ferry and beaches on the SW- side of the Island. Within walking distance from the ferry 900m. Nice breakfast with , fresh fruit, juice, eggs, toast/jam the and coffee. Nights the make a lovely dinner but you've to order in advance. Good WIFI, a fine terrase with every room. No deposit safe in room but at the reception, works fine. As i said in review rising sun great but i will not book with agoda you took $40 more than price quoted on booking ( including currency exchange) i emailed you but no reply tried to call no answer, i have used agoda many times in the past you have usually charged a few dollars over estimate but this is to much currencies have not changed that much as i have checked. Rising Sun Guest House is a wonderful place, I liked it very much and would recommend to travelers. My room was comfortable, beautiful, very clean. Fridge and aircon working properly, the bed and linen were excellent. Everything was fine, no disadvantages. Stuff is very friendly, pleasant people. Delicious breakfast and dinner! A large portions! And it was not expensive (drinks for extra payment). Guesthouse is across the street from Veuve National reserve (forest, nature park, where you can walk), and is close to Union Estate Park (a few minutes walking) and Anse Source D’Argent. Anse Reunion (the beach near guesthouse) was not for swimming. Fine beaches for swimming (Grand Anse etc) are in the other part of La Digue (there are no hotels there), you can walk about half an hour, or take a bicycle (available for the rent in guesthouse). I had a nice time at Rising Sun and would be happy to come again. Very nice guesthouse run by a family. 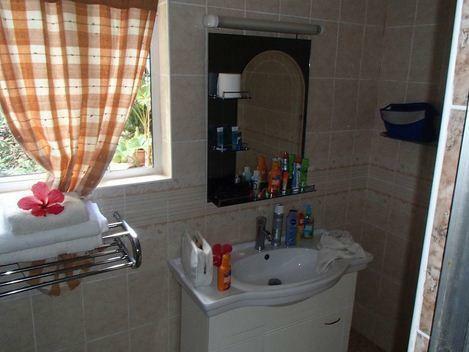 The location is perferct near the shops and everything you need. Breakfast is good. We stayed here for 12 nights. The owner also invited us for dinner at Christmas. You can have also dinner everyday, which is indeed very good. Really enjoyed the place, lovely staff, great location. I would highly recommend it, would stay there again. Excellent accueil. Bon petit déjeuner. Excellent buffet de poissons le soir. Location de vélo. Agréable jardin. Bien situé. Personnel serviable. Bonne adresse pour visiter l'île à vélo ! Un hotel d aspect vieillot, mauvaise literie et salle de bain petite et peu pratique.Hebergement sauvé d une appréciation catastrophique par la qualité des repas et la gentillesse de la personne qui servait. très bon séjour dans une chambre spacieuse, avec un emplacement de bon choix, un accueil chaleureux et un patron maitre cuisinier qui vous fera apprécié la cuisine locale. vraiment à conseiller. Auf unserer Tour, waren wir 3 Tage auf La Digue. Mal abgesehen davon, das wir nicht das beste Wetter erwischt haben, war die Unterkunft zufriedenstellend. Das Personal freundlich, die Lage nur ein paar Gehminuten vom Strand entfernt. etwas zu bemängeln war die Sauberkeit (es gab staub & spinnweben - wir sind eigentlich nicht pingelig aber das war nicht so schön). Das Zimmer ist relativ klein & eine Küche ist nicht vorhanden (ist ja auch kein Self Catering) - Wasserkocher war vorhanden welchen wir allerdings nicht verwendet haben. Fahrräder gibt es direkt bei der Unterkunft für 100 SCR / Tag. Wir würden wieder dorthin gehen. Das Frühstück war für lokale Verhältnisse gut. Nebenan ist der beste Take Away der Insel. Alles bestens! wir haben zwei wunderbare Nächte in diesem Guest House verbracht, vom Frühstück bis hin zum Besitzer gibt es gar nichts zu bemängeln. Nur unter dem Bett wurde nicht gewischt, sonst ist das Zimmer sauber! Wir würden auf jeden Fall wieder in dieses Guest House gehen beim nächsten La Digue besuch! wurden täglich 13 tage lang ab 4 uhr morgen durch hahn gekrähe vom nachbargrundstück geweckt (das heisst der hat 2-3 stunden mit 10 sekunden unterbrechung durchgekräht) DAS IST LA DIGUE hiess es als wir im gästehaus eine bemerkung machten. die ganze facilitie machte einen schmuddeligen gesamteindruck. wir fühlten uns mehr als Last als wie ein gast. essen war ok aber jetzt kein kulinarisches highlight. und mit nachspeisen haben sie es nicht so, die waren nicht so toll. Buona posizione, camera pulita ed accogliente, giardino piccolo ma curato, personale gentilissimo e disponibile, aree a comune un po' spartane. prima colazione e cena ottime. Unico neo verificate le biciclette che vi propongono a noleggio, le nostre erano molto mal ridotte.